It is with great delight that the RTL Widnes Wild welcome Dr. Stuart Brittle to the team, known to this team mates as Brittsy. As well as having a doctorate from the Department of Physics and Astronomy at the University of Sheffield Brittsy has found the time to play a significant amount of ice hockey, icing for teams such as the Telford Tigers, Hull Stingrays and Sheffield Steeldogs. 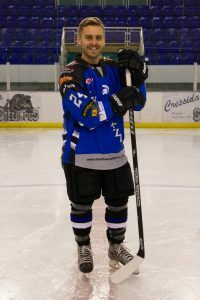 Averaging a 1.31 points per game average in NiHL Division 1 the 33-year-old who is originally from Telford will bring a vast amount of playing experience to the Wild having played over 400 games at an EPIHL level. Stuart will be wearing the number 24 shirt and his home, away and warm-up shirts are all available to own ‘n’ loan and more information can be found here.